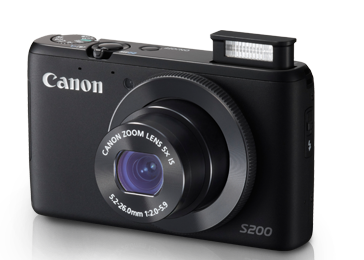 Canon has launched PowerShot S200 in India, which comes with Control Ring and Controller Wheel for which suits people who prefer to shoot in Manual mode. The camera comes in compact body design which makes it easier to carry and comes with Advanced DIGIS 5 Imaging processor. The F2.0 aperture camera lens is a 24mm Wide angled 5X optical Zoom Lens with a F stop of F/2.0 and F/5.9 which allows you to shoot across wide range. The camera also comes with WiFi connectivity which allows you to easily upload your pics to your gadgets and share them instantly. CameraWindow app available on android and iOS platform will allow you to upload the images efficiently and share them across the web. The Advanced DIGIC 5 imaging processor enhances the camera’s HS System by incorporating an advanced algorithm to deliver exceptional image quality. 24mm 5x optical zoom that can be extended to 9x zoom using ZoomPlus. Digic 5 imaging processor which reduces noise at as high as 6400 ISO levels without compromising on details or resolution. WiFi capabilities, allowing easy and instant sharing of clicked images and videos on other devices as well as on social networking sites. The camera is designed for those jumping from beginners stage to intermediate platform and such users will find it convenient while switching from S series. The PowerShot S200 has been priced at Rs. 19,995.